Harvard Medical School researchers believe the inflammation associated with the chronic skin condition may be to blame. 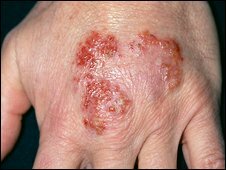 The study published in Archives of Dermatology study follows other work linking psoriasis with health problems. The condition, which affects up to 3% of the population, is linked to an over-active immune system. It causes skin cells to divide too fast, leading to the formation of scaly "plaques" of unshed cells on the surface. The Harvard team focused on 78,000 female nurses who were free of diabetes and high blood pressure at the start of the 14-year study. Women with psoriasis were 63% more likely to develop diabetes and 17% more likely to develop high blood pressure than women without psoriasis. The link remained strong even after taking into account factors such as age, body mass index and smoking. The researchers said that inflammation was a known risk factor for high blood pressure, and may also contribute to insulin resistance, a condition which often leads to type 2 diabetes. Alternatively, they suggested that use of steroid therapy or other treatments for psoriasis may in some raise the risk of both conditions. Writing in the journal, they said: "These data illustrate the importance of considering psoriasis a systemic disorder rather than simply a skin disease. "Further research is needed to better understand the mechanisms underlying these associations and to find out whether psoriasis therapy can reduce the risk for diabetes and hypertension." The Psoriasis Association said ciclosporin, a tablet used to treat moderate to severe psoriasis, had been linked to high blood pressure. However, it said the extent of the relationship between drug therapy and problems such as diabetes and high blood pressure was unclear. "We would urge anyone concerned about developing diabetes or high blood pressure to make an appointment to discuss it with their GP." Ellen Mason, of the British Heart Foundation, agreed further research was needed fully to understand the effect of psoriasis on the inside of the body. She said: "As psoriasis is already a difficult, long term condition to endure, it is important to reassure people that there were many women with psoriasis that did not develop diabetes or high blood pressure during the course of the study."